View of St Marylebone's Church as it stood in 1793. This small church was built in 1740 to replace an earlier medieval parish church and is situated at the north end of Marylebone High Street. 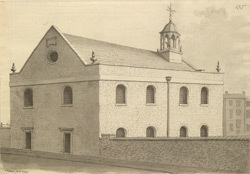 The church was originally dedicated to St Mary the Virgin, by-the-bourne (the Tybourne - a stream which ran nearby), and in time it became known as "Marylebone". Many well known figures were associated with the church including Charles Wesley, who was buried here in 1788, Lord Byron, who was baptised here in 1788 and Lord Nelson, who also used the church.